Top Mount, Drop Through or Drop-down Longboards, Your Choice? →Drop Down vs Drop Through vs Top mount – Best board type for beginners? Drop Down vs Drop Through vs Top mount – Best board type for beginners? With so many longboard shapes out there, its tough to know what to get. Starting out, I was definitely confused by this but over time I learned about the differences and found the best shape for my style. This time I’ll be comparing specific board shapes and the styles they are good for. The shapes I’ll talk about are top mount, drop through and drop down. What is a Top Mount? Top mount boards have the trucks mounted directly underneath the board. This makes the board more maneuverable and responsive to input when you ride the board. With the mounting position, you can put most of your weight directly on the trucks and they will turn sharply. You also get a lots of grip from the wheels. These features make top mounts great race boards where you need a lot of grip and turning, and also as cruiser boards for that nice surfy feeling onboard. However due to their ride height, topmounts are the least stable shape at high speeds and they are prone to wheelbite. If you’re a beginner then I’d recommend this shape to you for dancing and cruising but not downhill as it is a bit advanced. Loaded Tesseract is a great example of top mount longboard. It is relatively small and comes in at 39 in in length and 10.8in in width. The length makes the setup maneuverable and allows you to get the most out of it when cruising or free riding. The top mounting of the trucks allows you to get maximum grip from your wheels, so you won’t suddenly slip out when carving really hard.The deck itself is tiny bit flexible, so you get a really good riding experience because it won’t pick up all the nasty vibration you get from the road. However, you lose a bit of traction with the flex but it goes a long way to add to a comfortable ride. You can find the Loaded Tesseract on Amazon.com here. What is a Drop Through board? Drop through boards have a cut out where the baseplate sit on top of the board with rest of the trucks coming through underneath. This lowers the centre of gravity making the board feel more stable and easier to push and footbreak. However, the drop through longboard trucks will be less reactive to your input. These boards make great cruising and carving boards. The drop through trucks are super easy to slide making them good for beginners. These decks usually have cutouts for unlimited wheel clearance so you don’t get wheelbite. However they feel more drifty and don’t carve as much as the other options. I would recommend these to beginners wanting to learn how to slide and others looking for comfortable cruisers. Can you topmount a drop through deck? Yes you can. You can experiment with how drop through vs drop mount feels and really learn the differences. Sector 9 Fractal, a 36in longboard might be the best drop-through on the market, particularly cause of its length. It’s hard to get a drop-through under 40in in length but the Fractal comes in at a “tiny” 36 inches. 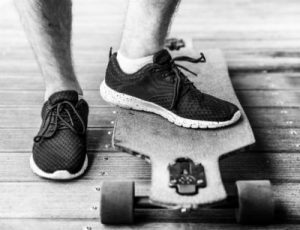 This allows you to have all the stability, easy pushing and footbraking that comes with owning a drop through, but none of the sluggish maneuverability. The short length allows for a smaller wheelbase which translates to tighter and faster turns. There is nothing worse than a slow turning skateboard, heed my words. Sector 9 built this board with big 69mm wheels and Gullwing reverse kingpin trucks (rkp). The big wheels will provide a comfortable ride and the rkp trucks will turn smoothly. The deck is made from maple laminate so it is quite sturdy, it can easily support heavier riders too. You can check its current price on Amazon.com here. 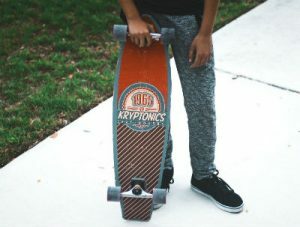 What is a drop down longboard? 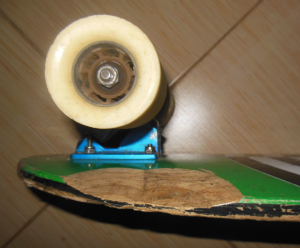 A drop deck is essentially a top mount that has a drop in concave making you stand lower than your trucks on the board. These boards are great for all types of riding and I personally love them for freeriding. They have more grip than a drop through but less than a top mount making sliding easier. They are also more stable than a top mount but have less truck response. This is all due to a lower center of gravity. Some boards have lower drops and this means its easier to slide and push but you sacrifice grip and responsiveness. I would recommend these to all types of riding like long distance pushing, pumping, freeriding etc. and especially to beginners. A drop-down longboard should be as low to the ground as possible. That being said, even a little bit of a drop makes a difference. For example this Ten toes drop-down comes with risers that allow you to kind of modify this height, you can remove the risers to get closer to your trucks or put them back to get further. That said, I’d go with Landyachtz Switch simply because of how low it can get without risers, making it unique in this way. This deck is built for easy pushing, footbraking and maximum stability. The drop-down shape makes it easy for beginners to ride and cruise on it, and as such I would recommend it to them. The deck itself is made from 9plys of hard maple so it will be stable and stiff. This adds to how controllable it will be. You can check its price on Amazon.com here. Best deck for cruising & dancing? Same thing goes for dancing as well, as they share a lot of features with cruiser boards, but you need responsiveness for quick turning. I recommend top mounts and drop mounts with very shallow drops. Best for downhill & freeride? The difference between drop through trucks vs regular is how they are mounted. With drop through trucks you have to take them apart and mount the baseplate first through the cutout, then attach the hanger beneath. Getting the right longboard for your discipline really makes a difference so its important to pick accordingly. However, how your board is mounted is also personal preference, but I recommend beginners stick to our guide and pick drop decks, and then experiment with their second board.